Glenavon boss Gary Hamilton is determined to keep his focus beyond current results and instead stay centred on the bigger picture. November’s Danske Bank Premiership fixture list has been one of frustration for the Lurgan Blues, with the black-and-white a showcase of one point from three games. Ards boss Colin Nixon. Pic by INPHO. That return of defeats to bookmark a solitary draw has included a second blank scoresheet of the season in the weekend loss to defending champions Crusaders. Despite a drop down the standings from top spot, Hamilton remains keen to scratch beneath the surface of the statistics. Player development has been at the heart of Hamilton’s work since stepping into the Mourneview Park manager’s office. Rhys Marshall, Mark Sykes and Bobby Burns are just three respected names to have developed under the Glenavon boss thanks to a desire to turn every scenario into an opportunity to learn. 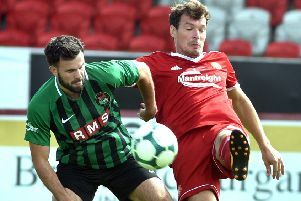 “Crusaders last weekend, in that kind of form with Paul Heatley and Jordan Owens flying, are almost impossible to play against and everyone over the course of the season will have dips,” said Hamilton. “But we look at the past three games and see certain patterns or areas we want to focus on as opportunities for improvement. “It is not about the result from one game to the next, as much as sitting down to analyse ways in which we can help players improve and develop towards the bigger picture for everyone. “You come away and use setbacks as a learning curve but, no matter the outcome on the pitch, we want to look at a situation and utilise it. “Defeats can hurt the confidence of young players but that is why it is up to the manager and coaching staff to educate. “It is not simply a criticism when we highlight a problem and we have so much faith in our young players. “But if our attacking players come off the pitch not having put away a chance then it is about making sure no-one goes hiding for the next time. “If we identify a defensive weakness it is about working on it and breaking it down to make sure we can improve. If the Glenavon manager’s mantra is defined by learning to draw positives from any situation, it is a viewpoint with which his Ards counterpart can identify. Colin Nixon has been left to reflect on highs and lows of life in the dugout during Ards’ opening half of the season. Ards’ struggles at the top end of the pitch have resulted in blanks across the past three appearances to send Nixon and his players to the bottom of the league table. Defeat to Newry City AFC last weekend left Ards four league games without victory, a sequence dating back to the highlight of the club’s campaign when October featured a memorable defeat of Linfield. “I’ve told the players the only way we can now go is up,” said Nixon. “All we can do is continue to fight and work hard together. “It is so tight around the bottom end of the table so we must take it on the chin at present. “Performances have been good but we end up shooting ourselves in the foot at times. “Anyone who has watched us will see a side creating plenty of chances but that ability to stick the ball in the net is massive. “At this top level you will always get punished for the lack of that clinical edge.